In 2019, Germany focuses strongly on Digitalization. 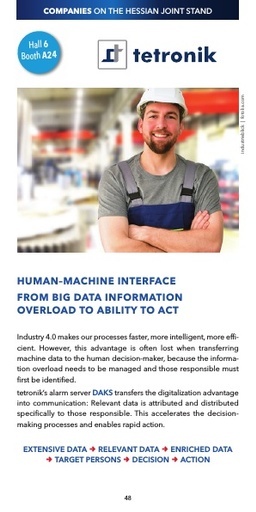 Industry 4.0 makes our processes faster, more intelligent, more efficient. However, this advantage is often lost when transferring machine data to the human decision-maker, because the information overload needs to be managed and those responsible must first be identified. 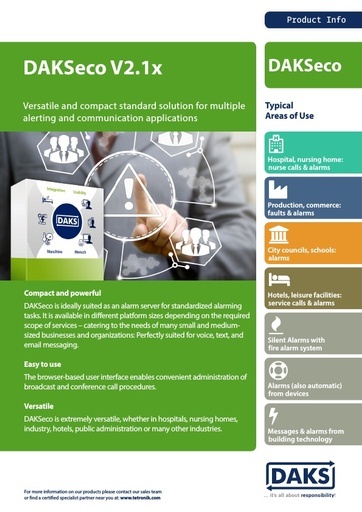 DAKS transfers the digitalization advantage into communication: Relevant data is attributed and distributed specifically to those responsible. This accelerates the decisionmaking processes and enables rapid action. What does this mean in particular for your company? Visit us at the Hessen booth and find out more about how DAKS can help you benefit from the nationwide subsidy for your Digitalization project. The automation of business and emergency processes is a Digitalization process supported by the nationwide go-digital campaign. On the topic "From Big Data information overload to ability to act". Look forward to an evening full of ideas and dialogue. Make new contacts in politics, science and business. Get to know R&D from its entertaining side. Be our guest with snacks and music. In the Forum tech transfer (booth C02) at 5:15 pm you will be welcomed by Federal Research Minister Anja Karliczek and Lower Saxony's Science Minister Björn Thümler. Following an impulse from the Chairman of the Digital Council, Dr. Katrin Suder, a discussion on artificial intelligence will take place. Robotics expert Prof. Sami Haddadin, Mrs. Iris Plöger, member of the executive board of BDI and Fraunhofer President Prof. Reimund Neugebauer will also be on the podium. At 6:15 p.m. the first Science Slammer of the Fraunhofer Society enters the stage, afterwards our DJ takes over to end your day with music, snacks and drinks. In addition: two more science slams - supported by Fraunhofer. PS: You won't need a registration or a ticket. Simply come together with colleagues, friends and partners on Monday evening in Hall 2.